This is my first time posting here. But here it goes. Anyway, thanks to Lootyhoof for the guide about Complete Themes. 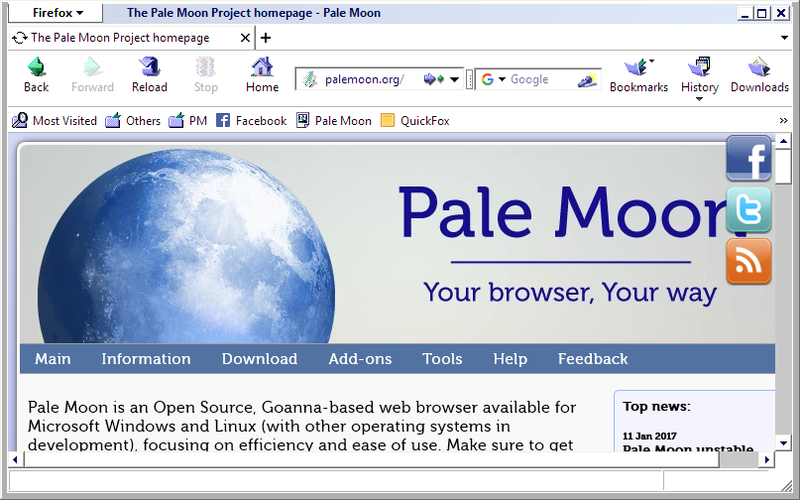 Moonscape features the classic theme that was featured in earlier versions of Netscape. It is a fork of Foxscape by Michael Walden. If you need any help or advice please feel free to be in touch. I can be reached either via PM here on the forums, email (linked on my GitHub profile), IM services (contact me on one of the other methods to get this), or the Pale Moon IRC chat. If/when you're happy with this being on the Pale Moon Add-ons Site let me know and it can be arranged. Thanks for the tip. Yes, I'm okay with it being posted in the PM Add-ons Site. Wow, that takes me back a ways. Great work! Does it happen in your PM? Very nice! Thank you for forking this theme and hosting it on the Pale Moon add-ons site. I am using it now. Very cool. Don't know if I'll continue with this or go back to Past Modern Revisited in the long-run, but I'm really happy to have both to choose from. Re: the RSS icon.. This is a common issue specifically this RSS icon to display like that when the Theme does not know about it. The developer of Moonscape will have to audit their theme to include things specific to Pale Moon (stuff that was added or stuff that was reverted when removed by Mozilla). Theme Development is a process and it takes a minute to get back into the swing of it and takes even longer to become great at it, as Ryan would attest to. Give it a few I am sure the developer of this theme will solve these minor issues. What is great is that someone else is creating themes for Pale Moon. That must not be overlooked despite some exceedingly minor glitches in initial releases. The animated Netscape logo that transitions into the logo of the website you are visiting on the individual tabs is a really nice touch. I missed that logo. Sorry for taking a week to update and fix some of the glitches present in the initial release of the theme. Anyway, here it is. or by checking for updates in the Add-ons Manager since I've already uploaded the updated file to the PMA FTP (I guess) . The tutorial for managing the subskins for this theme will be updated later. FranklinDM wrote: Sorry for taking a week to update and fix some of the glitches present in the initial release of the theme. Anyway, here it is. Yeah, keep the good work! or by checking for updates in the Add-ons Manager. Pale Moon doesn't have a Chrome folder under browser in Windows 10. I tried to just put the pack in under "browser", which probably predictably did not work. Where is Pale Moon's Chrome folder or it's equivalent? Using Windows Explorer search, I am only getting files related to the Chrome web browser, which obviously is not what I am looking for (Although, to be fair, I get impatient after the first gazillion minutes of searching and eventually just close the window Maybe it would show it to me in like hour five. ). Sorry for that . The readmes will get updated in the next release. The chrome folder doesn't exist by default, you may need to create a new one in its place. Not only does this add the wheel in the upper left by the name of the webpage on the bar instead of the moon, there is also the old "N on a mountain at night with a green starry backdrop" thing you can add via customizing the toolbar after installing the add-on pack. It even animates with meteor showers when websites are in the process of loading and is static when they aren't. Really cool theme. I'm still debating with myself whether or not I want to actually replace the Pale Moon desktop icon with a Netscape icon to load the program. I can do that myself if I decide I want to. That's simple enough. Have you considered the possibility of a splash screen when the browser loads? CharmCityCrab wrote: Have you considered the possibility of a splash screen when the browser loads? Yup. It's already in the theme's files but I can't seem to find any working Splash extension for PM. It says, "for Windows"; can this be installed on Linux? gracious1 wrote: It says, "for Windows"; can this be installed on Linux? Sadly, no. Icon packs on Linux are encoded in a different format (.xpm) but that might be considered in the next release.